The official Accounting Basics for Students accounting dictionary provides readers with all the accounting terms and definitions needed for a solid understanding of the subject. 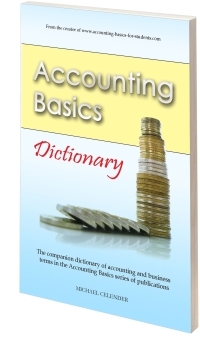 This accounting dictionary provides definitions of basic accounting terms (debtors, accruals, gross profit, etc.) as well as advanced accounting terminology (gearing, working capital, standard costing, etc.). Commonly misunderstood business terms (such as hire-purchase, remittance advice, liquidity). With simple, concise accounting definitions and well over 300 accounting (and related) terms defined in total, this is the perfect companion for both the working bookkeeper, accountant, businessman or office manager, not to mention students studying accounting and related subjects at high school and college level. The Dictionary is available on Amazon in softcover and is also available as an e-Book on Lulu.com (different cover but same book). Get this book on Amazon for just $8.95! Get $2 off the book for ordering directly from my webstore! Use coupon code 2QE7V3DR to get it for only $6.95! By purchasing this book (or any of my books) you are helping support this website and keep the information here free for visitors from all around the world. Thanks very much for your support. Note that this accounting dictionary is also included in the official Accounting Basics for Students basic accounting book, which also includes all the accounting lessons on this site as well as companion accounting questions and exercises.